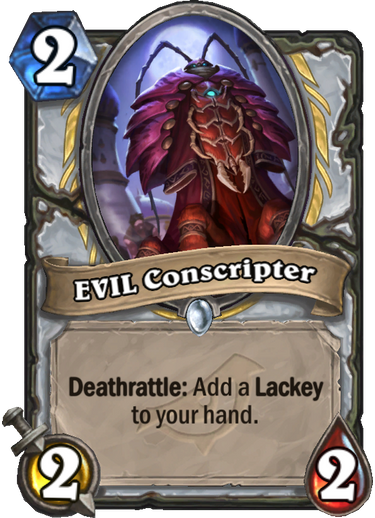 A lackey generator is never bad, but this might be the weakest one printed, since receiving the lackey is delayed via the deathrattle. Nevertheless, it’s a solid body for 2 mana that produces good value. 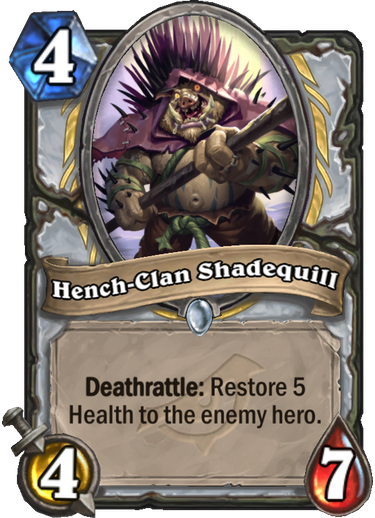 The question becomes whether Priest can justify playing this card when it doesn’t have inherent synergies with lackeys. Time will tell. Silence Priest is back on the menu, and this card is one of the best delicacies listed. This card is both a silence effect and a Faceless Manipulator. It pays for itself in terms of value and tempo even when the target is just an Ancient Watcher, and things become truly scary once we enter Arcane Watcher territory. Terrific card that makes every minion you play a threat even before it’s silenced. The only issue with this card is its narrow use. You probably wouldn’t play this in any other archetype, so if Silence Priest falls flat, so does this card. The fat Zombie Chow. 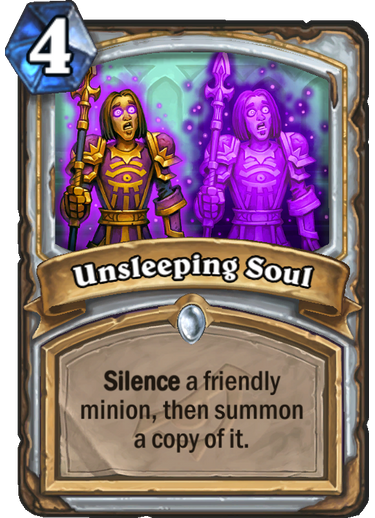 This is another excellent card to play in Silence Priest, but unlike Unsleeping Soul, you should probably play it in every Priest deck. The drawback is hardly relevant in slower Priest decks, and it gives you a strong body to contest the board with, something Priest should appreciate. We’re feeling the return of Injured Blademaster, Circle of Healing and Auchenai Soulpriest with this card. Good removal card that plugs a gap in Priest’s removal hole and is much more versatile than Shadow Word: Pain or Shadow Word: Death. 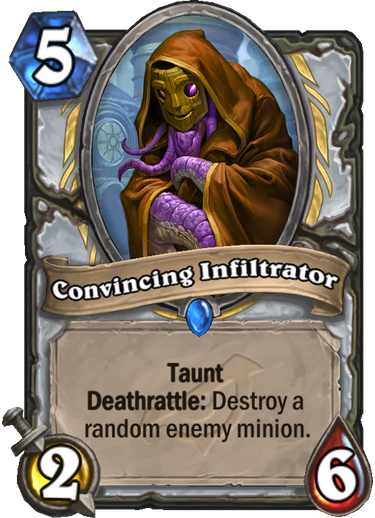 The problem with the card is that it will likely take up your whole turn to remove a threat, so Priest decks that are focused on initiative may not want this card. Control Priest? Yes please. This card synergizes with both resurrection and deathrattle mechanics. The problem with this card is that it pays a heavy price for its ability with a very underwhelming body. In a dedicated deathrattle deck, you will want this card, but it’s hard sell for anything else. 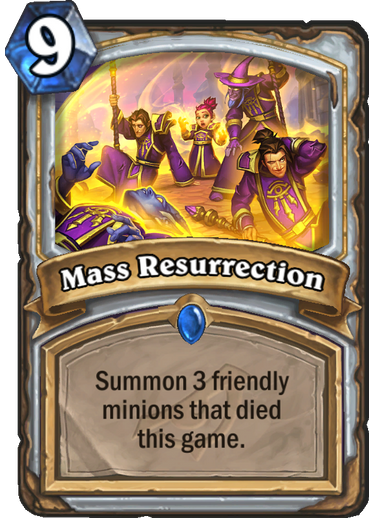 There was some outrage when this card was revealed, as many amongst the player base is sick of facing resurrection mechanics. After Big Priest, Gallery Priest and Wall Priest, there is some player fatigue involved. We wouldn’t fret too much about it, because this card is a much worse version of Diamond Spellstone in a world where Priest can’t cheat out threats and resurrect them early. It’s interesting that you can resurrect multiple copies of the same minion, but a specific way to abuse it with the upcoming card pool doesn’t stand out. Might be relevant in a deathrattle or “wall” deck. Cabal Shadow’s Priest best friend, this card allows us to Mind Control minions as early as turn 6. The drawback is that the card is quite slow to upgrade, so it might not be ready by the time we would like to use it. 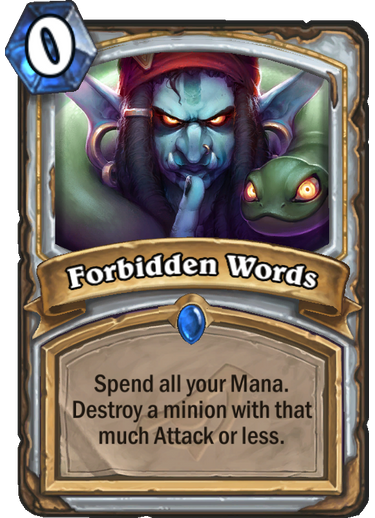 It also works well with Forbidden Words if we want to cheat out removal and sacrifice a 2 for 1 exchange for tempo. 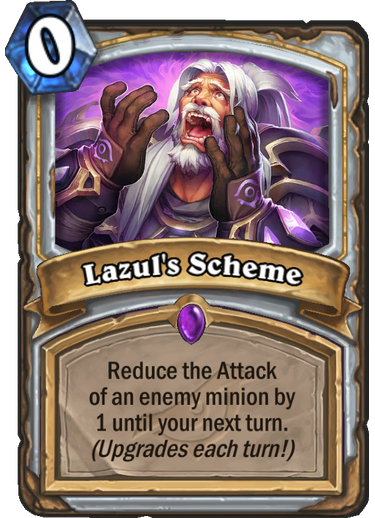 Priest has always appreciated cards that manipulate attack values, so Lazul’s Scheme will probably find a home. 2-mana Prince Taldaram for deathrattle minions. 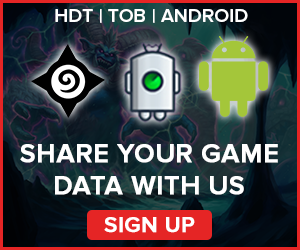 Narrow application cards such as Shadowy Figure are harder to predict because their appearance is entirely dependent on whether their dedicated archetype pans out. We’re not too enamored with Deathrattle Priest decks, so we’re giving this card a modest score. 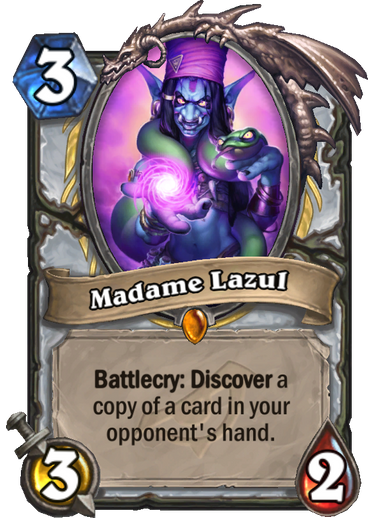 3 mana 3/2 discover a card is already good, but the fact this card shows you the contents of your opponent’s hand makes it even more valuable. This is a staple in every Priest deck that can afford to run it without clashing with deck building restrictions. A Control Priest’s dream and a far better card than Chameleos. In faster matchups, you can pick up a cheap card that can help you fight for the board. In slower matchups, you can get a high value card or pick the right moment when you’re most interested to spy or fish a card from on your opponent. 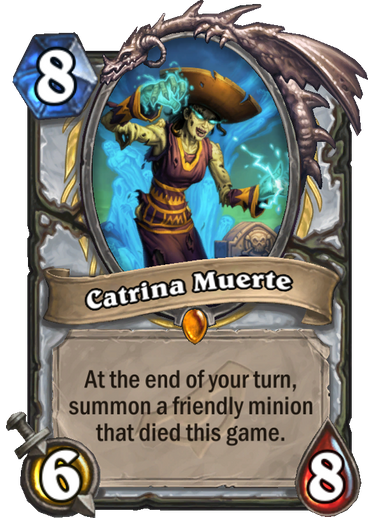 Catrina is a strong card that can be played in many Priest decks. A person that looks at this card might be too fixated on a resurrection deck, but the fact is that any reasonable body that spawns from Catrina should pay for itself. 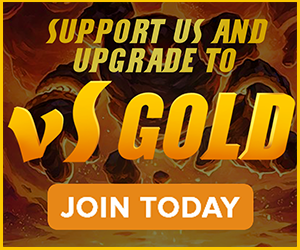 As a 6/8, we only need to resurrect a 3-drop to make the investment worth it, though we would obviously like bigger bodies. The key advantage of Catrina is that she’s a recurring threat that will continue to produce value if left alone, and she can also resurrect herself. 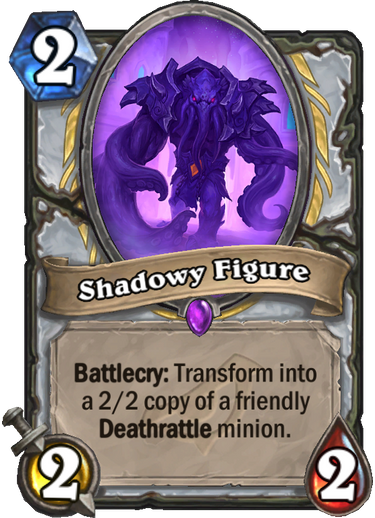 Priest fans might be able to breath out a sigh of relief, as Rise of Shadows has brought out a set of cards that plug major holes in the class’ evergreen kit. 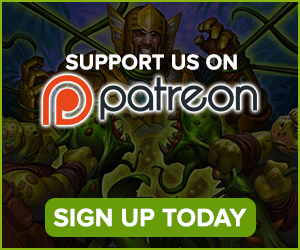 While the class may struggle to close out games without Shadow Visions, it got some interesting tools that could push it in a more proactive direction. 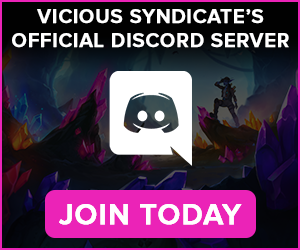 Without Psychic Scream, it will need to fight harder for the board, so be prepared for Priest decks that are very different from the ones we currently see.